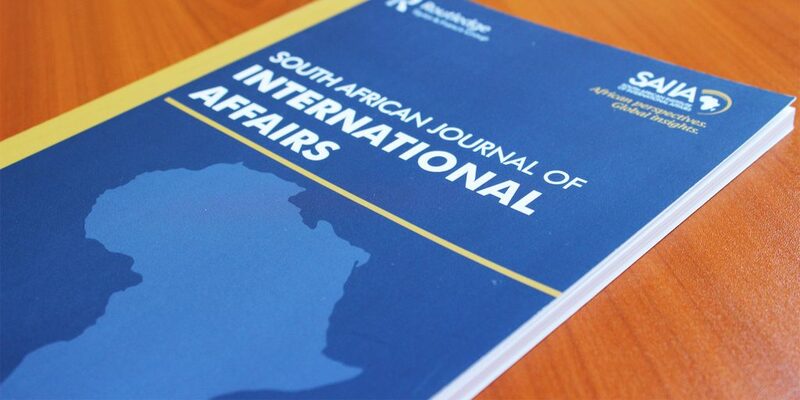 The South African Journal of International Affairs (ISSN 1022-0461) is a vibrant interdisciplinary forum for debate on all foreign policy issues affecting Africa in general or South Africa in particular. It is published by Routledge, of Taylor and Francis. Published since 1993, our journal is fully peer-reviewed and maintains its accreditation. It includes articles on topics such as global and continental governance, multilateralism and political/economic integration, strengthening of democracy and political party systems in Africa, protection of human rights, international trade and investment, governance of natural resources, environmental protection, security and conflict, migration and refugees, religion and ethnicity, the roles of state and non-state actors in international affairs, and the influence of emerging powers on Africa and the world. Our journal is currently published four times a year, and has an editorial board that includes Daniel Bach, Fantu Cheru, Christopher Clapham, Jakkie Cilliers, Kuseni Dlamini, John Dugard, Mervyn Frost, Jorge Heine, Jeffrey Herbst, Thierry de Montbrial, Laurie Nathan, Sara Pienaar, Roberto Russell, Maxi Schoeman, Richard Steyn, John Stremlau, Ramesh Thakur and Alex Vines. For sales and subscription information, visit the Taylor and Francis website. If you are based in Africa, you can purchase an annual subscription for only US$15 by contacting the Taylor and Francis Customer Services team. You can also access our journal via your university library, if your university holds a subscription. We are seeking unsolicited article submissions on all international relations topics pertinent to the continent, especially articles written by African authors. Articles must be original in content. They should analyse significant policy issues in African international affairs, with a view to offering constructive solutions. Articles may, inter alia , deal with global/continental governance, multilateralism and political/economic integration, strengthening of democracy and political party systems in Africa, protection of human rights, international trade and investment, governance of natural resources, environmental protection, security and conflict, migration and refugees, religion and ethnicity, the roles of state and non-state actors in international affairs, and the influence of emerging powers on Africa and the world.Articles should be between 6,000 and 9,000 words in length and must be written in a style that is accessible to both professionals and laypersons. The article should be referenced in endnote format. See our Journal Style Guide for more information.